First map to show the continental shelf break for a significant portion of the west coast. Pacific Coast from Point Pinos to Bodega Head California. 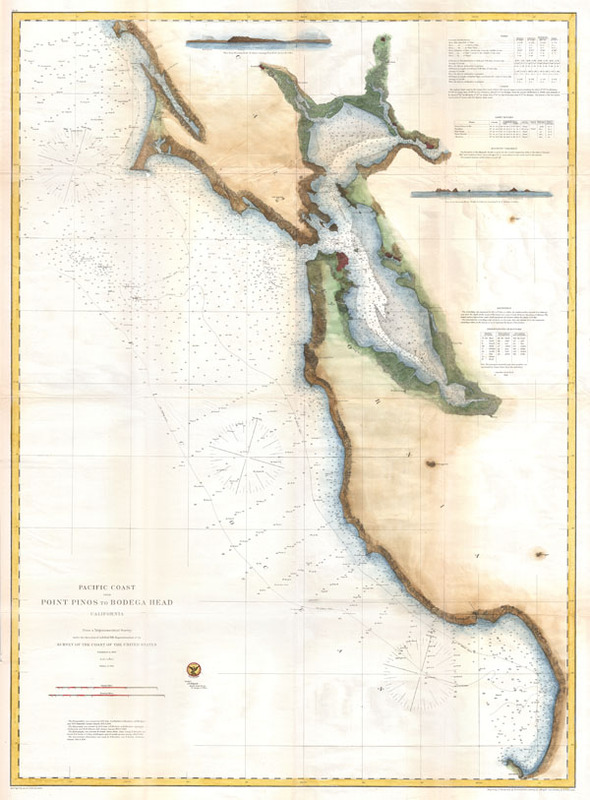 An extraordinary 1866 U.S. Coast Survey nautical chart or map of the San Francisco Bay. Covers from Point Pinot north was far as Bodega Head. Includes all of the San Francisco Bay with river systems documented as far north as Napa and Petaluma. This is one of the rarest and most desirable charts issued by the U.S. Coast Survey as it is the first chart to depict the continental shelf break for a significant portion of the west coast. It also provides a stunning overview of this region shortly following the California Gold Rush. Includes the cities of San Francisco, Oakland, Napa, Petaluma, Brooklyn, Union City, Vallejo, Redwood City, Alviso, Monterrey, Santa Cruz, and others. Identifies Mt. Bache, Black Mountain, Montana Mountain, Mount Diablo, and Table Mountain. While this map offers only minimal inland detail, the maritime detail is extraordinary. Offers thousands of depth sounding throughout and identifies various important bays, sounds, islands, shoals other undersea dangers, lighthouses, beacons, rivers, etc. Notes on lighthouses, tides, soundings, and magnetic variation appear in the upper right quadrant. The triangulation for this chart was completed by R. D. Cutts, G. A. Fairfield, G. Davidson, A.F. Rodgers, and W. E. Greenwell. The topography was exceuted by R. D. Cutts, A. F. Rodners, A.M. Harrison, J. S. Lawson and W. M. Johnson. The hydrography is the work of Commander James Alden, Commander R. M, Cuyler, Commander B. F. Sands, A. F. Rodgers, E. Cordell, and others. This chart was prepared under the supervision of A. D. Bache, one of the most influential Superintendents in the history of the Coast Survey. Issued in the 1867 supplement to the 1865 Superintendent's Report. Very good condition. Minor toning. Verso repair and reinforcement along original fold lines. Blank on verso.